New York’s a place I’d love to visit, but it’s probably not my top pick for motorcycle riding. A bustling, pothole-ridden city is hardly the safest place to head out on two wheels. 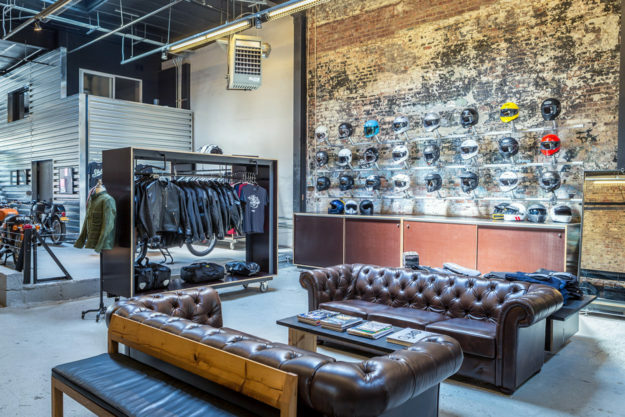 Yet there’s a substantial motorcycling community in NYC—and Union Garage has them covered. Founder Chris Lesser (along with his partners and crew) is a curator of riding gear that gets the elusive balance between functional and good-looking just right. Union’s website is also one of our favorite online stores to browse. Their product descriptions are always thorough and helpful, and their journal offers up regular insights. So we pitched a bunch of questions at Chris about his store, what Union Garage stands for, and why we should visit. When did you start Union Garage? We started in the fall of 2012 in a 300-square-foot space that previously served as an artist’s squat. We cleaned it up and made the most of it for a couple years while we got on our feet, but it sometimes felt like working in a submarine. Last August we completed renovation on our new, current space—a 3,000 square-foot showroom adjacent to the original store. The upgrade was much needed. Tell us a little about your building. It opened as a marionette theater, around 1910! It was later a dentist office, an auto garage, a marble tile cutting shop, and a commercial print shop. The store is now a beautiful, raw industrial brick space. 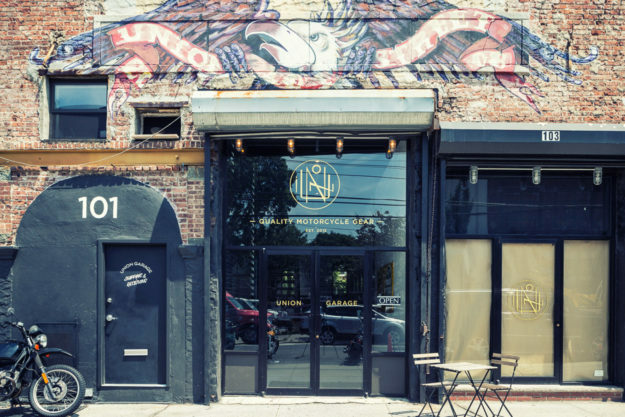 It’s tucked into a mixed-use commercial and residential neighborhood a half-block from New York Harbor. There’s a commercial container port at the end of the street, and every once in a while we’ll see the Queen Mary II or some other cruise ship sail by. What’s it like inside? This place has un-replicable patina. We took the raw space and built custom fixtures specifically to house heavy armor-equipped jackets, and cabinets to hide bulky helmet boxes. And plush couches in the middle so people can relax. Space is at such a premium in NYC, it’s rare to find high ceilings. Most are lofted or parceled up. The best part about the new store is the sheer size; with 20-foot-plus ceilings and new skylights, it’s airy and open. What are your customers like? We get grizzled old guys who’ve been riding since before I was born (1980). We see younger riders coming in, who have just moved out of their parents’ house, and have recently bought their first bike. And we see lots in between. This is a great place to be a fly on the wall, because we get some really interesting people walking through the door. I’ve made many friends and heard lots of great stories. We’ve had opera singers from Mexico City, fourth-generation violin bow makers, chefs, celebrities, celebrity chefs, rock stars, workaday Cambodian dancehall singers (seriously), and loads of creative types. It seems every fourth customer is a photographer. Plus we get a lot of international customers coming through, while on business or vacation in NYC. It makes it an exciting place to work. 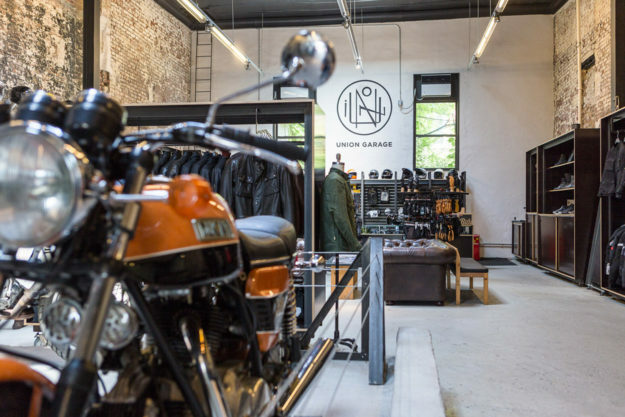 So what exactly is Union Garage all about? It’s printed right over the door: Quality Motorcycle Gear. 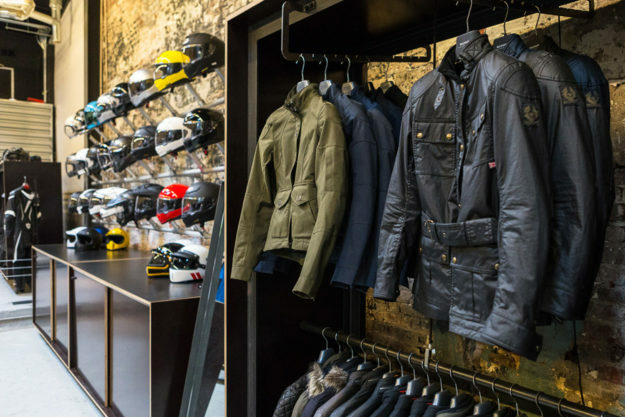 That means helmets, jackets, boots, gloves, and a growing catalog of smart accessories. 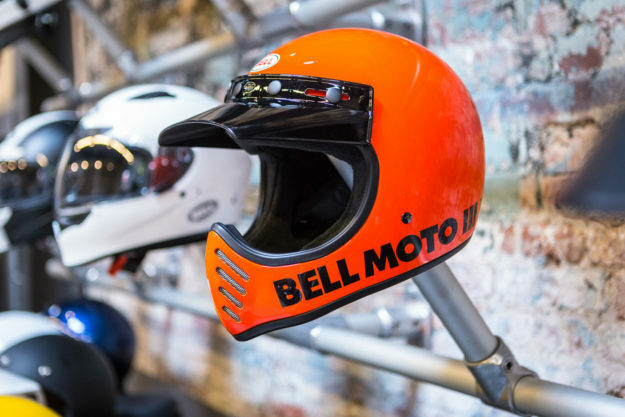 We take the safety gear aspect seriously—as serious as a motorcycle accident. To that end we spend a lot of time in-store on education, and basically just talking to folks about the blender of physics that happens when things go wrong on a motorcycle. 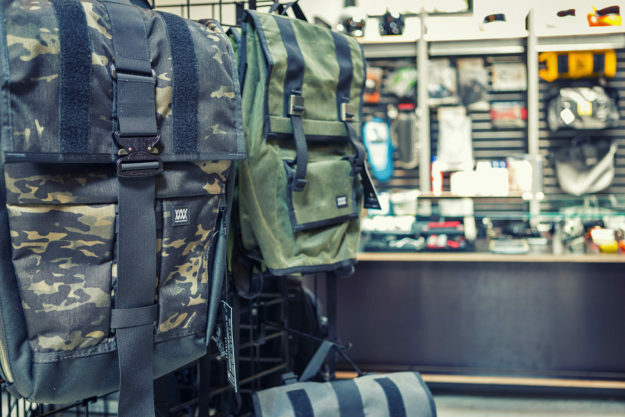 We take a pretty blunt and honest approach to gear and what it can or can’t do. Owning and riding a motorcycle is an inherently dangerous activity—especially in a city. We’re here to make it safer, easier, and more fun. But the right gear is important, and what’s ‘right’ depends on what and where you’re riding. We are brutally honest about the strengths and limitations of this or that product. Nobody here works on commission and I’d rather not sell someone a piece of gear than sell it to them with unrealistic expectations of what it will do for them. Our whole shtick is the curating aspect—presenting a sensible collection of gear. There’s so much poorly designed product in the motorcycle space, people seem to appreciate the simple service of getting a bunch of well conceived gear in one place. 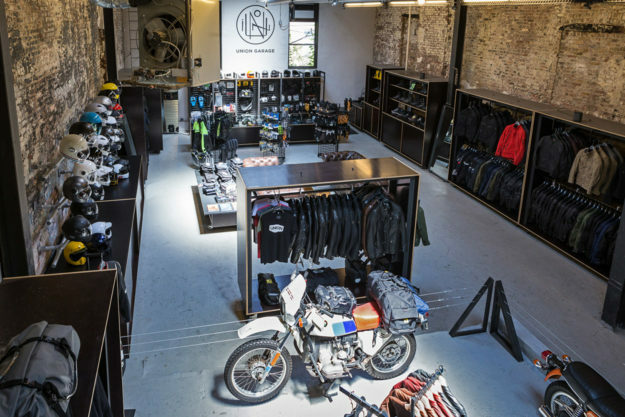 What’s on offer besides moto gear? We don’t have a barbershop or a restaurant in the store, nor do we sell much in the way of lifestyle accessories. 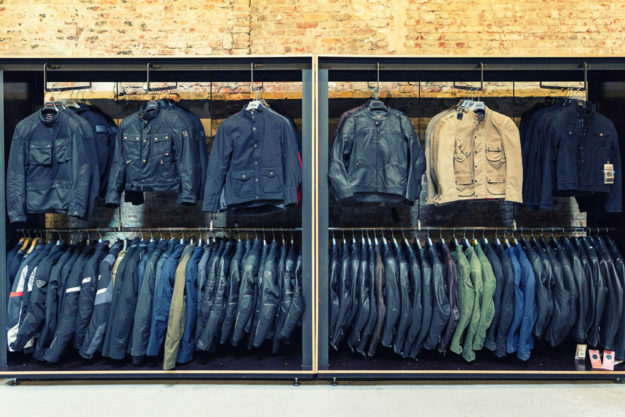 There are no casual knits, seasonal sweaters, men’s grooming products or surfboards here. Not that there’s anything wrong with any of those things. I shop at places that sell all those things. We just try to stay focused. We’re also not a coffee shop, but we do have a commercial espresso machine in the back and coffee is free for anyone who makes it down to our little corner of town. What are your most popular products? Our classic deerskin gloves are a perennial bestseller. We’ve also gotten into the bag category lately. We sell a ton of road-trip accessories. 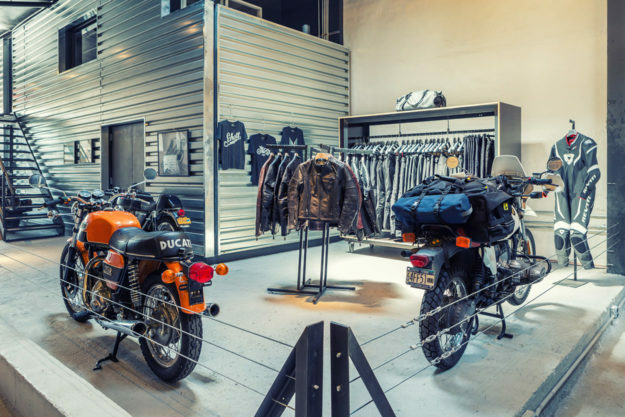 Motorcycle touring is an important part of our DNA and it’s fun finding new products to make life on the road better. 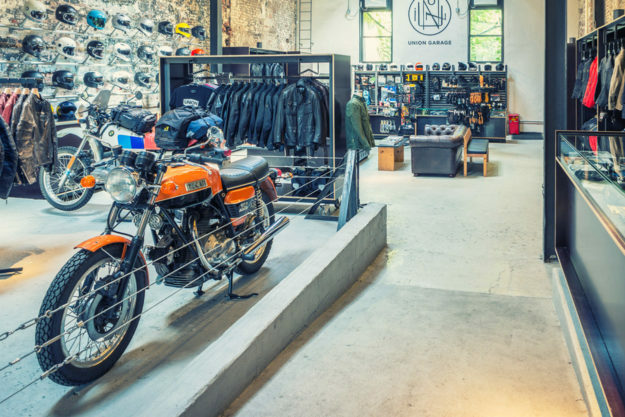 We also sell a lot of what I call Milk-and-Egg products—the basic covers, locks, passenger helmets and rain gear that can be essential to owning a motorcycle. Do you produce your own gear too? Our Union Garage Tool Roll does well. We’ve made a few refinements over the years and it’s a pretty tight little kit. As much as anything we made it as a response to all the other tool rolls out there that sell for sometimes exorbitant prices, but come completely empty. Like they’re a purse or a fashion statement. Ours is based off the original BMW factory took kit and comes with a full complement of high quality tools in a handmade roll that’ll last a lifetime. It’s super functional—that’s the statement we want to make. And our armored waxed-cotton Robinson jacket made for us by Vanson has also continued to do well. We’ve got an armored leather jacket collaboration with Vanson coming out soon that we’re really excited about. It’s been about a year and five prototypes in the making, and I’ll be glad to see it hanging on the rack finally. Is there a workshop on site, or are you just a retail space? We like to think of it as more than ‘just a retail space’ but no, we are not a workshop. One of my business partners is Peter Boggia of Moto Borgotaro, right next door. Anything else on the go? 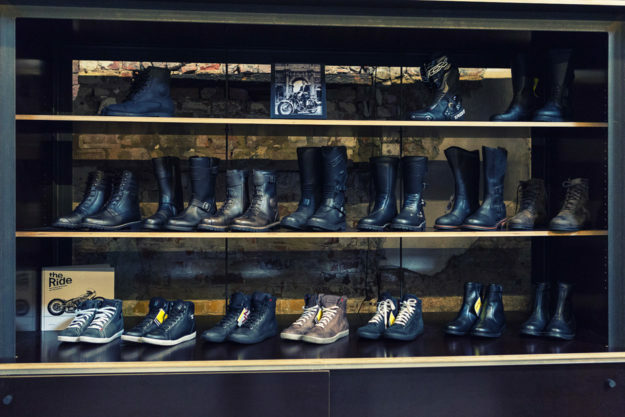 Lately we’ve been using the store as an events space, like hosting a heavy contingent of riders from the store for the Distinguished Gentleman’s Ride. We try to organize a few rides every season, we’ve had a few photographers and world travelers come give presentations, and we just pulled off our first art show with illustrator extraordinaire Ryan Quickfall. Union Garage NYC, 101 Union Street, Brooklyn. Open 12 to 7pm Tuesday to Friday, 11am to 6pm Saturday, 12 to 6pm Sunday. Images by Ethan Covey.